Flowers; growing in loose racemes. Calyx; five-cleft. Corolla: of five almost linear petals notched at the apex. Stamens: numerous. 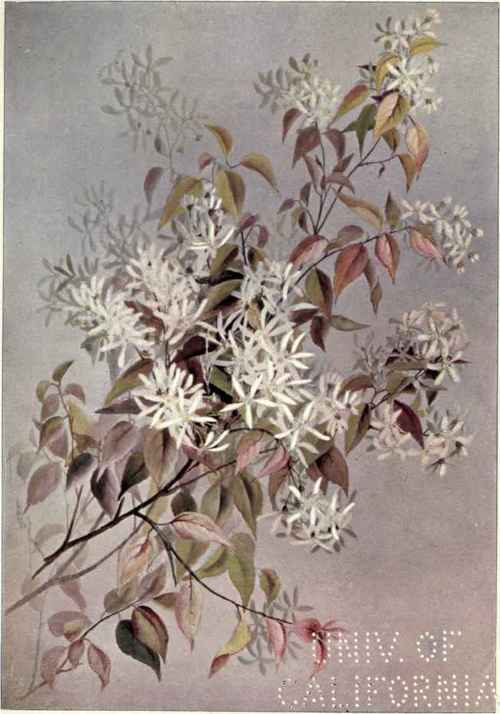 Pistils: numerous; styles, five. Fruit: a small purplish pome, sweet and agreeable to the taste. Leaves; on petioles; ovate; rounded at the base; serrated. A shrub or tree, sometimes reaching the height of sixty feet. "Gay circles of anemones Danced on their stalks; the shad-bush white with flowers Brightened the glens." - Bryant. When the shad begin to frolic in the spring waters this beautiful shrub unfolds its fleecy petals by the pasture thickets. As we wander forth, it waves and beckons to us the joyful tidings that the spring has indeed come. The translucent, pale green of its leaves and the soft creamy whiteness of the bloom speak of the unsullied newness of its life. It is also a pretty sight in June when in fruit. A. alnifblia is a smaller shrub of the west which has been looked upon as a mere variety. The petals are shorter and the fruit more rounded than that of the preceding. In fact, the several wild species have no very marked differences, and are sometimes regarded as one by botanists.